This week marks the summer solstice, which means your summer planning should be in full swing. Don’t know what to do with your summer months? That’s what Foodie Underground is here for. Every year we come up with a list of fun things to do with your summer vacation, all food related. Let the summer season commence! 1. Of all the things to do this summer, you should probably be making a kombucha cocktail at some point. 2. Write a short story about a vegetable. 3. Use olive oil instead of butter in a recipe. 4.Write a cookbook. Or at least a chapter of one. 5. Pick out your favorite summer food and paint a picture of it. 6. Make a rhubarb shrub. Your friends will love you. 7. Grind your own flour and make a loaf of bread. 8. Throw a dinner party in a field. 9. Make a set of greeting cards with your favorite food quotes. 10. Screw a mason jar onto your blender and make a smoothie. Yup, this actually works. 11. Get a burr grinder. Seriously, you’re still using a blade?? 12. Make your own sriracha. 13. Find some friends and go clam digging. 14. Forage berries and make your own ice cream. 15. Sew your own reusable produce bags. 16. Make ice cubes with fruit in them. 17. Since last summer you mastered homemade marshmallows, this summer start infusing them with different ingredients. Lavender and honey anyone? 19. Take a camp stove to the park and make breakfast outside. 20. Make a set of chalkboard mugs for a friend. 21. 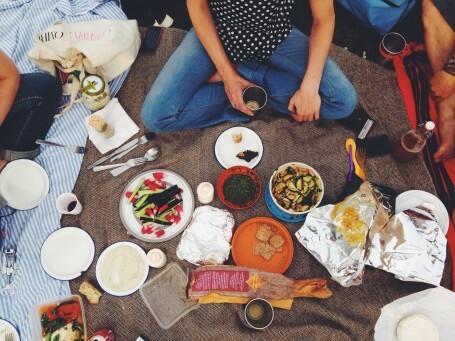 Plan an outdoor food documentary festival. 22. Volunteer with a local food organization. 24. Think of a country whose cuisine you know nothing about. Host a dinner party with food only from that place. 25. Stop buying nut butters and make your own. 26. Build a new kitchen storage system using old crates. 27. Two words: frozen watermelon. 28. Build a picnic table with built-in beer/wine cooler. 30. Host a disco soup party. 31. Open a lemonade stand for a weekend. 32. Make a dip using cashews. They’re surprisingly creamy. 33. Skip the Mexican restaurant and brew up a batch of your own horchata. 36. Make your own bitters. 37. Build a wine crate carrier on the back of your bike so you can put your vegetables in it when you shop at farmers market. 38. Ask your grandmother for her five favorite recipes. Write them down. 39. Bake a chocolate chip cookie serving bowl. 40. Have a rosé and socca night and dream about being in the south of France. 42. Use dried herbs in your own tea blend. 43. Put your homemade tea blend into homemade tea bags. 44. Cure and store garlic. 45. Oh, hello cold brew cocktails. 50. See if there are five things in your kitchen that you can live without. Minimize. 51. Print with fruits and vegetables. 52. Use a soda can to make a cookie cutter. 53. Put fruit in your second kombucha fermentation. 54. Stop buying vanilla extract and make your own. 55. Make seed bombs and throw them somewhere that needs some brightening up. 56. Do your own flavored salts. 57. See if you can make a baguette. 59. Find a farm you can go and work on. 60. Start an herb garden. 61. If you have a backyard, dig a fire pit. 62. Roast corn in your new fire pit. 63. Make ice cubes out of coffee to use in your cold brew. 65. Design a chicken coop. 66. Start using hemp seeds in recipes. 67. Makes popped amaranth instead of popcorn. 68. Read a book on food policy. 69. Pretend like you’re a kid with a lunchbox again and make fruit leather. 70. Paint a set of plates. 71. Get to know your edible flowers. 73. Visit a local cheesemaker. 74. Save your glass jars and use them to serve dessert. 75. Write fortunes for fortune cookies. 76. Make a meal using zero processed ingredients. 77. Infuse something with pine needles. 78. Churn your own butter. 79. Bake your own tortilla chips. 82. Shock yourself by making one-ingredient ice cream. 83. Grow herbs in mini planters on your bicycle. 84. Instead of goji berries, buy blueberries. 86. Make a picnic kit (utensils, plate, durable glass) that’s ready to go at the drop of a hat. 87. Go to an estate sale, buy old tea towels, and sew them into napkins. 88. Build your own grill. 89. Forget kale chips and move on to CHARD CHIPS. 90. Soak peaches in bourbon. 91. Go to a U-pick. 92. Do a wine tasting 101 class. 93. Buy spices so you can make your own za’atar. 94. Build a worm composting system. 95. Make your own peanut butter cups. 96. Use avocado to make chocolate mousse. 99. Get your a sourdough starter going. 100. Think of 100 more things to do because you went through this list in less than a month.